Healthy Lanka Alliance for Development has been presented with the award for Best Alcohol and Drug Prevention Organisation for the year 2015 by His Excellency Maitripala Sirisena, President of Sri Lanka. The award was presented in recognition of Healthy Lanka’s dedicated services towards creating a well-informed society free from alcohol and drugs. Since it was established as a FORUT partner organisation in 2011, Healthy Lanka Alliance for Development (HLAD) has worked actively with communities in eight districts in the country as well as government institutions and civil society organisations. The aforementioned award was presented especially in recognition of the part played by the organisation in the National Temperance Movement of Sri Lanka and the Sri Lanka Alcohol Policy Alliance. The picture above shows His Excellency, the President of Sri Lanka, handing over the award to Mahendra Jayasinghe (left) and Chamika Jayasinghe from the Healthy Lanka Alliance for Development. Below: HLAD representatives at the ceremony. The award ceremony held at the Bandaranaike Memorial Conference Hall on 23rd July was an event held under the precedence of His Excellency Maithripala Sirisena, marking the 104th anniversary of the National Temperance Movement. It was an occasion at which alcohol and drug prevention organisations and activists received recognition and appreciation for their dedication and commitment towards protecting the health and wellbeing of Sri Lanka’s people. The National Temperance Movement, comprising social activists dedicated to preventing alcohol, tobacco, and drug use among the youth, dates back 104 years and operated hand in hand with the pro-Independence movement which at the time was campaigning for freedom from British colonial rule, both movements receiving much popular support. The ceremony was also a valuable opportunity for the aforementioned organisations and activists to voice their suggestions for the further betterment of the country and its people. Prior to the event, the Sri Lanka Alcohol Policy Alliance, a coalition of civil society organisations devoted to alcohol and drug prevention, headed by Healthy Lanka met on two separate occasions for consultations regarding policy level controls for the proliferation of alcohol and drug products in the country. A list of suggestions for the formulation of new policies as well as amendments to the existing policies was prepared at these consultations and presented to His Excellency Maithripala Sirisena at the award ceremony. 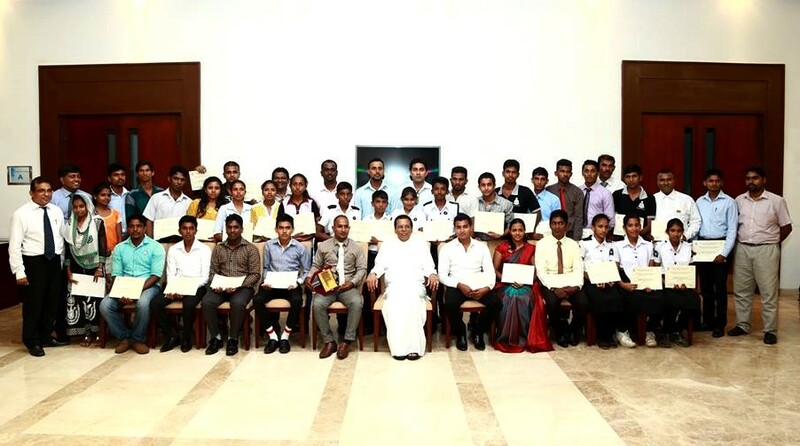 Another significant event at the above ceremony was that 159 National Trainers that received technical training from Healthy Lanka were presented with certificates by His Excellency. A venture initiated and funded by the Sri Lanka Alcohol Policy Alliance, the capacity building of trainers able to conduct national level training programmes for prevention workers was a task given to Healthy Lanka. Trainees (below) were selected from Healthy Lanka’s current working locations and were trained in the latest scientific methods in alcohol prevention based on the Expectancy Challenge Model which focuses on changing how intoxicants are perceived and responded to in society. The successful completion of the course is a significant step forward to the prevention of intoxicants in Sri Lanka.